Hardware-independent storage services eliminate storage challenges in virtualized environments. Traditionally, vSphere admins requested assistance from the storage administrator to provision storage for new VMs. This provisioning leads to an increasingly complicated process that requires multiple convoluted steps, slowing down the process. Furthermore, storage administrators have no visibility to the VMs residing on the storage they provision. 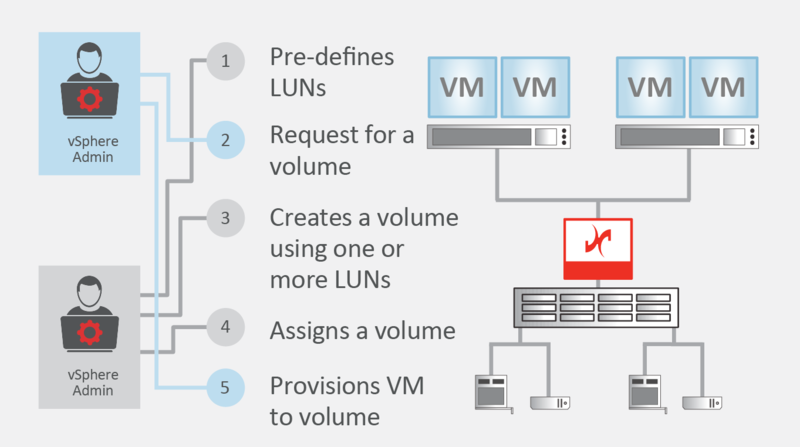 As a result, they either manually record the VM to LUN mapping on a spreadsheet or create one datastore per VM. This makes the management of storage infrastructure for virtualized environments complex, costly and inflexible. Today, with VMware Virtual Volumes (VVols), the vSphere administrator takes greater responsibility for provisioning storage and becomes responsible for defining the various storage policies for VMs. In addition, storage administrators no longer have the arduous task of managing storage to VM mapping or create one datastore per VM. VVols facilities pre-determined policy-driven automation, which enables more agile storage consumption for VMs. This ultimately delivers faster provisioning for new applications and any associated data services. Moreover, storage administrators can create a snapshot of a specific VM. VVols enable policy-based self-provisioning and management of storage at the time virtual machines and storage are created. First, the storage administrator creates a “storage container” that is assigned for usage by vSphere. This eliminates the need to assign individual volumes every time a vSphere administrator requests it. 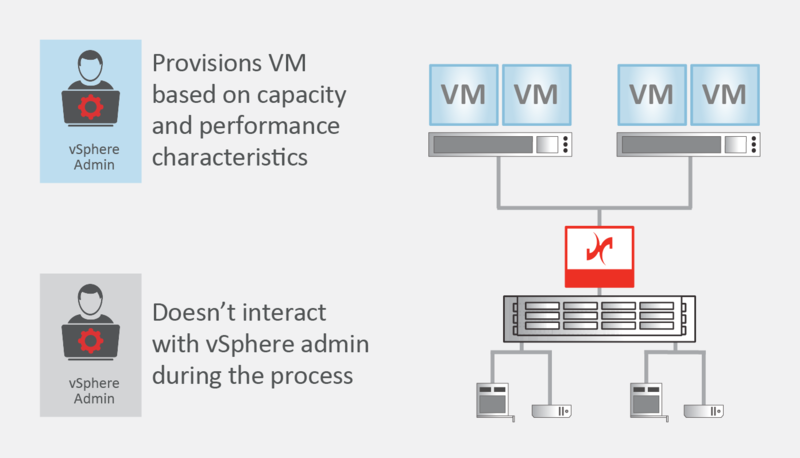 Then, the vSphere administrator assigns policies based on the characteristics needed to provision a VM. For example, the policies could be gold, silver or bronze – gold being high performance and high availability; silver being medium performance, medium availability, and bronze for low performance, low availability. After that, VMs can be created in the container from the available space – using the storage profiles. Finally, vSphere Storage (VASA) API connects the new VM to the storage container. In short, when deployed, VVols take away the storage management burden that comes from provisioning VMs.. Both vSphere and storage administrators crave the simplicity and Virtual Machine (VM)-level of granularity offered by VMware Virtual Volumes (VVols). However, there are only a handful of storage vendors offering VVols – and only on a few of their latest models. Most currently deployed storage arrays and systems do not support VVols for a variety of reasons, primarily that storage vendors are not incentivized to retrofit legacy equipment with the new VM-aware interface. DataCore has emerged as the only vendor that can provide VVols functionality across existing and/ or all kinds of new storage. The DataCore™ SANsymphony™ and Virtual SAN™ software layer currently allows storage and infrastructure administrators the benefits of VVols for their legacy EMC, IBM, HDS, NetApp and other popular storage systems – including all flash arrays. Within hyper-converged environments, VVols can also be utilized as DataCore pools direct-attached storage (DAS) with the Hyperconverged Virtual SAN. Now enabled with VVols, vSphere administrators can ‘self-provision’ virtual volumes quickly from virtual storage pools without having to contact the storage administrator. They specify the capacity and class of service without having to know anything about the storage array that sits seamlessly beneath. Furthermore, DataCore provides the best price-performance to the VMs with its innovative Parallel I/O technology. Talk with a storage expert to learn how DataCore can help save extend VVols support across your entire storage infrastructure.